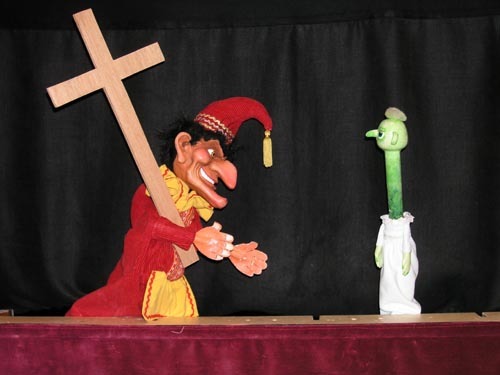 READERS will know that Ive been working with fellow Prof Martin Bridle on an adult Punch and Judy show commissioned by us from UK theatrical maverick Ken Campbell. The show has been received exceptionally well, we are pleased to say, and the whole project of releasing Mr. Punch from his childrens entertainer golden ghetto back into the wider community for a walk on the wild side will be moving into a second phase in 2005. I thought a journal intended for the readership of fellow Profs (and Punch enthusiasts) would be the best place in which to document for the project as a whole. It had always been a disappointment seeing non-Profs grapple with the familiar source material when producing films, books, or plays (with the shining exception of Russell Hobans Riddley Walker) and it was with an enormous amount of trepidation that Martin and I (along with actor/ventriloquist Josh Darcy) took the plunge and previewed the work at Londons Little Angel Theatre  where Steve Tiplady, the current artistic director, is reviving the interest in adult puppetry. (The Little Angel company itself has just had the most enormous mainstream artistic and critical success in collaboration with the Royal Shakespeare Company and a masque for puppets of Shakepeares poem Venus and Adonis. How often do you get puppets topping the bill with the Bard in Stratford-upon-Avon?) It is hard to explain the exhilaration we felt at the non-stop waves of laughter our show provoked. Here were adults behaving exactly like the child audiences we were used to. It exceeded our wildest expectations and showed that Mr. Punch had lost none of his primal power despite toning it down for children over the past century and a half. The creative process for the show had been complicated. 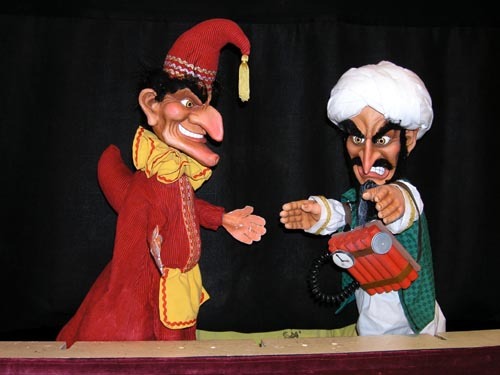 Ken knew little about Punch and Judy beyond what most theatrically minded Brits might know  but he has a brain that moves in different dimensions to most people. He and his circle of collaborators produced, as a first draft, an enormous scrapbook of suggestions, ideas, scraps, notes and jottings based round what they all knew about Punch. My role was to make sense of it. I decided I would choose the twenty ideas that I liked best (any one of which could have been the foundation for a play) and send the ball back over the net. I didnt want to put the ideas in any set order  as this might be taken as a list in order of preference  so I wrote each idea on a post-it note and taped each note to the back of a playing card. Thus we could deal the deck at random and discuss each idea on its merits. This we did over a lengthy cappuccino session with Ken and his companions. By now Id been working on the project on and off for a year and a half  persuading the funders to back the idea, getting a key Arts Centre involved, and negotiating with Kens literary agent. The show was to open in October, it was now February and the clock was beginning to tick loudly. This wasnt a show that actors could devise with a writer in rehearsal  the actors first needed making in somebodys workshop, and making the cast would in itself take time. By now Martin was in the loop. Hed been part of the decision making process about which twenty ideas we backed and we had jointly agreed the final selection (plus a few reserves) that Ken would start writing. There was still no format. Was this an event? A play? A lecture? Then Ken came up with the idea of basing the structure round the intensive script-doctor seminars that aspiring screenwriters pay top money to attend in order to beef up their product so as to pitch it better to Hollywood. This would allow us to have an outsider (a ventriloquial Bear as it turned out) going through the Punch story bit by bit to suggest updates, amendments and improvements for the 21st Century. Martin and I would be acting out the ideas using our respective booths. A first working draft of the script was created which (contractually) had to be approved within a certain time span. Martin and I got together for the serious job of working out if we could actually turn the script into puppet routines. Ken had seen videos of our shows and expressed total confidence in our judgement. If we said a scene would work as a Punch routine it stayed in  if we didnt see how we could make it work, it went. Martin and I spent two days going through all the scenes discussing what wed need to make each work from a Profs perspective. This was sheer delight (although daunting). One of the ideas wed bought into was that Judy should have had fertility treatment and produced quins. The planning of bits of biz based round IVF treatment and the babysitting of five babies (one of whom was demonically possessed) made us realise how far we were from traditional subject matter  but how near we were in terms of what you need to make a comic glove puppet routine work. By now Ken had also come up with his masterstroke. Hed discovered Eric, Count Stenbock. Thus we had the writings of a genuine Victorian eccentric to tap into when looking at Punchs history (we had to assume that an adult audience would need reminding of their basic Punch and Judy if they were to get the point of some of the updatings of it). One of Stenbocks references was to The Oriental Punch (which is) is chiefly obscene. Given that an adult Punch and Judy show would be have to make some nod in the direction of Mr. Punchs phallic connections this seemed the best place to do it. But how? Well, gentle reader, I can only tell you that we laughed ourselves sick trying out the possible options. And with funding from Arts Council England, too. By the end of our two days of routining we had a road map of the journey that would get us to the rehearsal period. The next thing was to commission the cast. Up until now Ken had been writing with a view to creating material that would fit the constraints of a solo Punch booth. Martin and I suggested that it would be appropriate for the 21st Century to update the presentation to widescreen. We figured that we could set our two booths on stage about six feet apart and then join the two with a playboard running the distance between them. The effect would be similar to a castle wall with a short tower at each end. On this bigger playing area we could then perform the show with two pairs of hands. This gave us the final structure for the show. Act 1 would be the script-doctor workshop and Act 2 would be the resulting performance. Wed also worked out how to end the show  that was a great relief all round. This is the first part of a two part article.